It's time for Kellan Kyle, the rockstar who captured our hearts in Thoughtless, to tell his side of the story. The only place Kellan has ever felt at home is on stage. Gripping his guitar in a darkened bar, he can forget his painful past. These days his life revolves around his music and his band mates, and that's the way he likes it. And then one woman changes everything . . .
Kiera is the kind of girl Kellan has no business wanting - she's smart, sweet, and dating his best friend. Certain he could never be worthy of her love, he hides his growing attraction . . . until Kiera's own tormented heart hints that his feelings might not be one-sided. Now, no matter the consequences, Kellan is sure of one thing: he won't let Kiera go without a fight. I have no words. 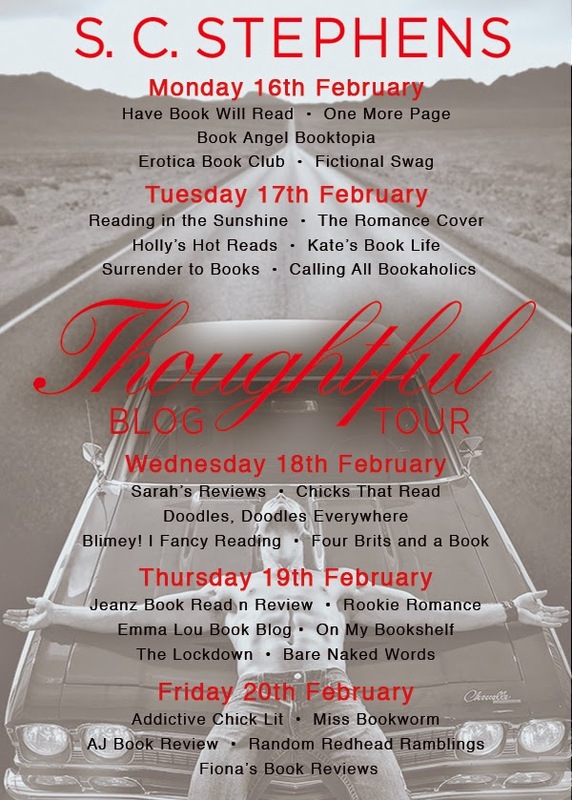 NO WORDS……..
Two and a half years ago I came across a book called Thoughtless and it broke me, so it was with apprehension that I agreed to review Thoughtful, I was pretty scared to read it, even though I wanted to get Kellan’s side of the story. So after giving myself a little pep talk, about how it’s only a book, it can’t physically hurt you, I put on the big girl knickers and went in. And there he was! Kellan “hot as all f**k” Kyle waiting to take me on this journey again. I feel like Kellan and the D-bags are close personal friends, I’ve known them for so long now and we’ve been through so much together. Bare Naked Words was born on the back of my love for this series. While I was reading Thoughtless I actually lay awake at night, trying to understand why Keira wouldn’t just choose Kellan, why was she being so damn well indecisive, hurtful and jealous. But if you sit back and think about it, she was young, insecure and confused by her feelings for Denny and Kellan and really didn’t believe she was anything more than a conquest on a very long list of conquests to him. While reading Thoughtful what we actually learn is, that as f**k hot as Kellan may be, his own insecurities are just as profound as Keira’s. He didn’t think we was worthy of her love either, which held him back from admitting this to her. Had he done so earlier who knows where their story would have gone? However, that being said, he actually understood Kiera’s predicament more than you would have expected him to, he understood how hard it would be for her to leave Denny, her first true love and tried to respect that, but in the end his feelings got the better of him and his heart hurt too much to live a lie or to play second best. Some of the iconic scenes from Thoughtless appear in Thoughtful and being able to experience these from Kellan’s POV was even more heartbreaking than seeing them from Keira’s viewpoint. The first time they were together… who can forget the stairs? The espresso stand, the rain scene and so many more that are ingrained in our brains. And my heart was as heavy as it was the first time round. Even though I know what happens, even though I know it works out in the end, SC Stephens broke me again! I wanted to hold Kellan and tell him it was going to be alright, I wanted to try and spare him the pain of, not feeling wanted, worthy or loved. I never hated Kiera, I understood how scared she must have been of her feelings for Kellan and I still felt the same way, this time, not that I didn’t want to shake her rather violently a number times. And to be fair, Kellan certainly got his own back on Kiera a few times, flaunting women in front of her and lying about Anna. SC Stephens proved once again what a talented and amazing storyteller she is, her writing is heart-shatteringly real, while still bringing us laugh out loud humour from our favourite delinquent rocker Griffin. The fun times between Kellan and Kiera were cute and brought a smile to my face, imagine how great they would be together if they would just do the right thing. There are often heated debates about this series at Bare Naked Words HQ, but one thing we all agree on, we will never, ever, ever recover from Thoughtless, it broke us and now I can add Thoughtful to the very short list of books that will stay with me forever. SC Stephens probably had no idea that Kellan would have this effect on the world, but I’m so glad she brought him and those D-bags to us. Now I must take my water logged kindle and my Post Kellan Stress Disorder to a quiet room and slowly piece myself back together.